The first Famicom light gun game to be released in Japan, inspired by the 1976 arcade game of the same name. 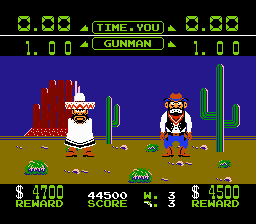 Set in the Wild West, shoot the outlaws before they shoot you. As you progress, the outlaws become faster and so your reactions have to improve. 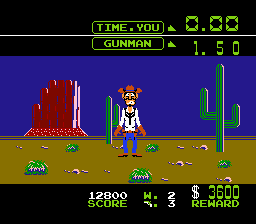 In this mode, you must shoot the outlaw as soon as "Fire!" is shouted, and before he shoots back. 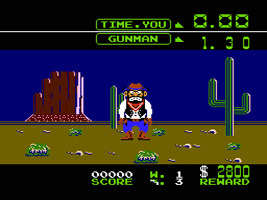 The outlaw's reaction time can be seen at the top of the screen, and you are awarded points based on the difference between his time and your own. You are penalised if you shoot before "Fire!". There are two outlaws. Try and take out the fastest shooter first. 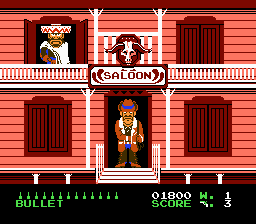 You are facing a saloon, and every time a window or door opens you have to shoot the outlaw. You only get a certain number of bullets per round and any you have spare at the end are tallied up for bonus points.